Anyways, September is just around the corner and my calendar is packed with fun things! Next week I’m heading to Paris for a super fun event that I’ll tell you more about soon, and after that I’m heading straight to New York for fashion week, seriously can’t wait! BIMBA & LOLA jacket. ELIZABETH COLE earrings (here). CÉLINE sunglasses (similar ones here). DAGMAR sweater. ZARA leather skirt (old but similar ones here & here). BACK STAGE* clutch. MICHAEL KORS gold watch (similar here & here) CARVELA KURT GEIGER attack black (similar ones here). This entry was posted in Outfit and tagged bimba y lola, carvela attack black, celine audrey sunglasses, dagmar, Michael Kors watch, minusey clutch by Carolina Engman. Bookmark the permalink. The clutch it’s really amazing ! Wow! This look is so so stunning! I’m in love with this jacket!Fabulous! That jacket is such a fun geometric print, something that doesn’t go with everything but is so cool that that’s not even a factor. First off love that bag! It reminds me of those furry ones Prada had a bit back. Going to search for yours right now. and I knew your shoes were Carvela, they’re a bit low for my taste but look great with outfit and especially bag! Have fun during your trips and get well soon darling! AMAZING bag, perfect outfit! Love it! gorgeous outfit! all the pieces are beautiful! Love how you styled the outfit, looks fab! Great outfit and that bag is so great. I love this outfit! The red lips are the perfect pop of color! oh girl, get well soon! i’m excited for you for your next gorgeous plans!! Gorgeous outfit and coat! Love it! love this outfit – especially the jacket, because it works with everything and is an eyecatcher! Such a gorgeous jacket & the earrings look fabulous on! GOSH, I love your heels. So simple and OH SO PERFECT! Such a gorgeous outfit! Your photos are stunning. this is one of your most fabulous outfits!!! you are gorgeous! Wow! Wonderful print on your coat! And bag is stunning! you look so amazing, we are madly in love with your coat! #amazing #lovely #chic #stylish #elegant #perfect I am in love with this outfit!!! OH I LOVE YOUR BLACK FURRY PET. Great outfit Carolina! Love the skirt and the bag especially. Sorry you got sick :( but it was worth it because that jacket is stunning on you. what a lovely oufit !!! This is pretty much one of the most fabulous coats I have ever seen. That print is just gorgeous! Love the jacket & your styling. Love the jacket & your styling much! I honestly envy all of you bloggers who have the change fly to New York. Fashion Week is just the cherry on top! That coat and clutch are perfect! They compliment each other so well! This whole outfit is perfection! Amazing jacket – the clever print looks almost leopard print from a distance. You look absolutely stunning, the earrings, the jacket, the clutch everything looks GREAT ! Love, love, love the look! I need that clutch! It is AMAZING!!!! Amazing! 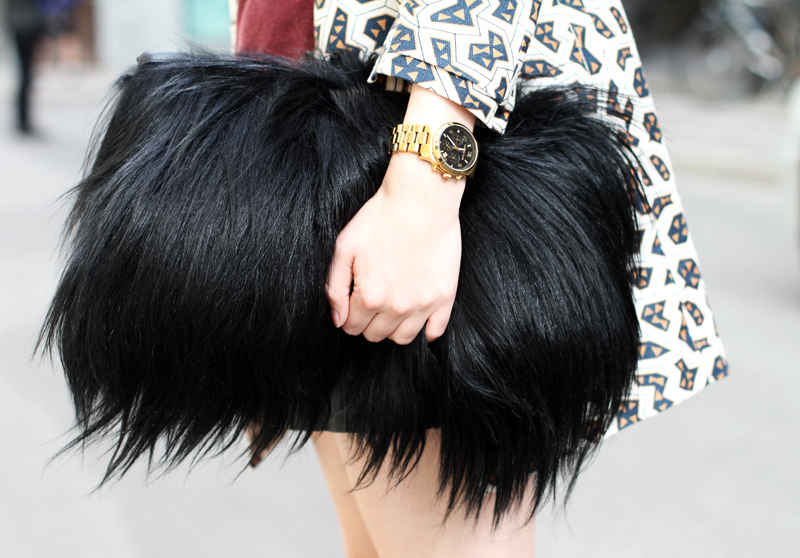 This clutch and coat are to die for! You look simply gorgeous,love the jacket and the clutch! Oh wow I love that jacket! Beautiful look! Love the print. love love this jacket so much! You look sooooo stunning *-*! Que guapa, me encanta el abrigo te queda genial. Vaya que mala pata que te hayas puesto mala, espero que estes mejor. Oh a furry bag! This jacket is so perfect. And the shoes… amazing! OMG you’re such a fashionista! Check out my new blog The Closet I Love! Wearing that gorgeous look would be worth the cold. In saying that, I hope you feel better. I’m in love with that jacket!! Amazing! Loving ALL your posts lately. Great work darl! I feel like you encompass almost every single trend; the animal instinct influence, the patterns, the oversized, the leather, the embellished, the red lips. You look like the definition of “Fall 2012″! Gorgeous look and I really like the bag!!!! You look so chic and I loveee that clutch!! I am completely IN LOVE with this outfit. First of all I love all the quirky accents, like the printed jacket and the feathered clutch. They add such personality to the outfit. However, the dress is just as gorgeous! I love the drop waist, and the leather accent I think just adds this class and sophistication that pulls the whole look together. Needless to say, I think this outfit is just so perfect. I might completely be in love with that coat! I’m SO IN LOVE WIT YOUR HEELS!!!! Gosh, they’re amazing! Of course it is ByL , all time favourite! Beautiful sunglasses and amazing Bimba & Lola jacket!!!!! The jacket really looks well on the cover picture , especially. And the bag is looking like you are wearing a lovely big cat in your hands. I always appreciate elegance, you did it so well. I LOVE YOUR LOOK!!!! IT IS AMAZING!!!! Amazing coat, looks lovely on you! Lovely Outfit .. Nice clutch and sunglasses ..
What a lovely jacket! so love the prints! You are very beautiful, gorgeous coat and purse. Love the details, black sunglasses and red lips – add chick to this ensemble!